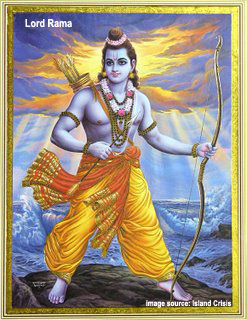 Shri Rama Navami celebrates the birth of Lord Rama to King Dasharatha and Kausalya of Ayodhya. It falls in the Shukla Paksha on the ninth day of the month of Chaitra and marks the end of the nine-day Chaitra-Navratri celebrations. Lord Rama is the 7th incarnation of Lord Vishnu who came down to earth to battle the invincible Ravana in human form. In Bhadrachalam the day also celebrates the wedding anniversary of Sri Rama and Sita. The festival is celebrated for 9 days and is marked by continuous recitals, Akhand Paath, mostly of the Ramacharitamanas, organized several days in advance to culminate on this day, with elaborate bhajan, kirtan and distribution of prasad after the puja and aarti. On the last day celebrations and festivities begin with prayer to the Sun god early in the morning. At midday, when Rama was incarnated on that day in Treta Yuga is marked with devotional service is performed with Bhakti and piety. The house is and decorated. Offerings of fruit and flowers are placed before the family shrine and prayers are recited. An image or picture of baby Rama is placed in a covered cradle. At noon the covering is removed and Prasad is offered to Rama, and then shared by the devotees. The festival is a focal point for moral reflection and being especially charitable to others. Celebrations at places associated with Sri Rama, like Ayodhya in Uttar Pradesh and Ramesvaram in Tamil Nadu, attract thousands of devotees.